As an avid outdoorsman and hunter who grew up and remains in Minnesota, there’s no question for me that autumn is the best season. The ducks begin migrating south, deer go into their rut, and the colors of the tree leaves come out in full force. There’s nothing like spending time up at the cabin or out in the woods with nature this time of year. But when you’re also an avid baseball fan like me, the month of October also means its pennant season in the major leagues. It’s really the best of both of those worlds. I spent an autumn night this time last year at Target Field with all my friends watching the Minnesota Twins fall to the New York Yankees in the Wild Card game, but unfortunately the team didn’t continue trending upward as they fell well-short of the playoffs in 2018. The young guys on the team that were supposed to boost them forward never seemed got their footing during the season, and so we’ll have to wait at least another year to get back to that place. It’s still those young players that will get them there however, and for many of the game’s prospects the fall brings with it more than just the start of their offseason vacations. Many of them will keep playing in the various winter leagues, and they begin with the Arizona Fall League where many of the game’s top players once played. The list of current Twins players who have appeared in the AFL includes the likes of Byron Buxton, Eddie Rosario, Max Kepler, Mitch Garver, Taylor Rogers, Trevor Hildenberger, and most recently Stephen Gonsalves and Andrew Vasquez. The 2018 season kicks off at 1:35 CST this afternoon and eight Twins prospects will be participating. For anyone who doesn’t know, the AFL is a short season league where every team in Major League Baseball sends some of their prospects in October. It is often used as a proving ground for players looking to take the final steps to their MLB dreams. Many of the top prospects in baseball are sent here to make a final impression for a call-up next year, but there are also many experienced minor leaguers on the doorstep who are evaluated for protection on the 40-man roster, or those trying to make up some development time after an injury. These minor league games in October can determine a lot going into the next MLB season for these players, and that’s why I love following the league so closely. Each MLB team typically sends around seven players to the AFL, and they are split up among the six teams that make up the league. This year the Minnesota Twins prospects will be represented on the roster of the Salt River Rafters, with pitchers Adam Bray, Griffin Jax, Hector Lujan, and Devin Smeltzer; and position players Brent Rooker, Travis Blankenhorn, Jaylin Davis, and Luke Raley. They will join prospects from the rosters of the Arizona Diamondbacks, Colorado Rockies, Miami Marlins, and Washington Nationals. In a little bit of extra-fun news for Twins aficionados, Chattanooga Lookouts manager Tommy Watkins will also make the trip and serve as the Rafters manager. Of the seven players sent to the AFL last year for Minnesota, only one managed to make their MLB debut with the Twins during the 2018 season. That was reliever Andrew Vasquez, who was also named Twins Daily’s 2018 Minor League Relief Pitcher of the Year. That was a low total for Twins prospects in the AFL making their MLB debut the next season in recent history, but hopefully 2018’s group can get that back on track. Each week I’ll be recapping the action for all the Twins representatives during their time in the desert of Arizona, so who are the players they sent? How have their careers gone thus far and what will I be looking for from each of them in the AFL this October? Drafted at number 35 overall in 2017 after a collegiate season in which he won the SEC triple crown, Rooker continued his power surge as a pro by clubbing 18 homers in 62 games between Elizabethton and Fort Myers. His prospect helium followed him to Chattanooga this year with high expectations. He started out slow but heated up with the weather by OPS-ing over 1.000 in the months of June and July. His 22 home runs ranked second in the Southern League, while his 79 RBIs paced the circuit. Although he didn’t really improve his strikeout rate as the year wore on, he did start connecting with more authority and drawing more walks. Despite the power he possesses, he batted number two in the lineup for basically the entire season with the Lookouts. Rooker will look to get back toward those midsummer numbers, as he hit below .200 over his final 30 games on the year with just two home runs. Despite that, Rooker is likely the most highly regarded of the Twins prospects participating in the AFL this year and could slot in the middle of the Rafters lineup. Twins Daily ranked him at #7 in our Midseason Top Prospect List and is a shoe-in for a spring training invite and promotion to Triple A to start in 2019. This is where the AFL season could be interesting for the slugger. The Twins have opportunities at all the positions Rooker has played as a professional including the outfield, first base, and designated hitter. A strong showing in the desert could only help his cause in relation to an early MLB debut next year. Something I’ll be watching for is if he can cut down a little on his strikeouts in a six-week sample size, while also continuing to provide some of his prodigious power. The Twins selected Jax in the third round of the 2016 draft out of the Air Force Academy in Colorado. This made his professional development somewhat of a challenge in his first two seasons. He was able to appear in just four games with Elizabethton after being drafted before he was required to fulfill service obligations, and then in 2017 the Department of Defense reversed a policy that allowed graduates to pursue professional sports after graduating, putting his career back on hold after just five games. Fortunately for him and the Twins, that changed early in the 2018 season. Jax was accepted into the military’s “World Class Athlete Program,” which meant his job with the Air Force became training for the Olympics in baseball which would be coming back for the 2020 games. Jax reported to extended spring training in late April and made his debut with the Fort Myers Miracle on June 1st. That was one of only 3 games through the end of the year where he did not complete at least five innings. His next seven starts were all of the quality variety, and overall 11 of his 15 games were of that type (he went the final six innings in an Ervin Santana rehab start for one of those games). He finished the year with a 3.70 ERA and 66/15 K to BB ratio in 87 2/3 innings for the Miracle. The AFL season will help Jax make up some of the development time he’s had to miss and could also be a strong barometer to determine where he’ll start the 2019 season in the state of Florida —back with Fort Myers on the gulf side of the peninsula or along the northern panhandle in Pensacola. I’ll want to see Jax continue to post a strong walk-rate against what could be the best competition he’s faced to this point, as well as continuing the consistency start-to-start that he showed with the Miracle to make his case. 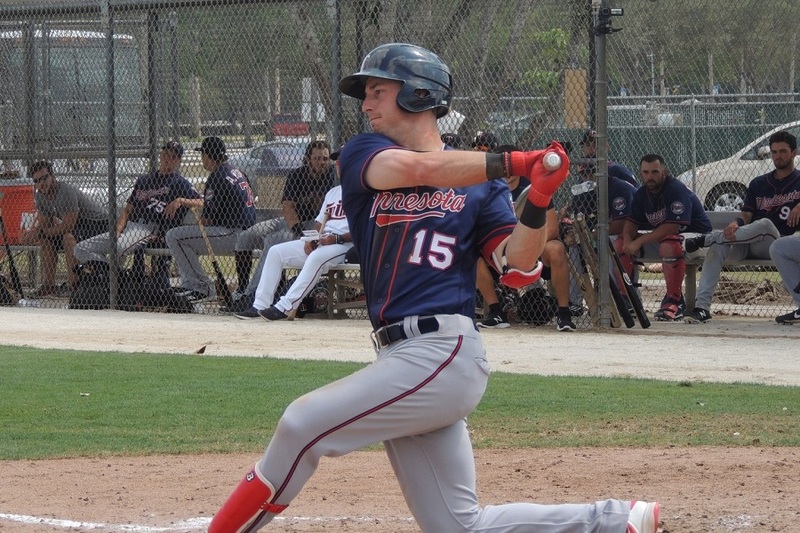 Selected in the third round of the 2015 draft out of Pottsville High School in Pennsylvania, Blankenhorn came in at number 13 in Twins Daily’s 2018 midseason top prospect list. Over the past two seasons with Cedar Rapids in 2017 and Fort Myers in 2018 he has split his time almost equally between third base and second base on defense. Touted for future power potential when drafted, Blankenhorn looks the part and even won the Florida State League home run derby this year, but hasn’t quite manifested it in games as much as he’d like yet. He hit 13 home runs in 118 games with the Kernels and added 11 homers this year with the Miracle. Unfortunately, his slugging percentage dipped from .441 to .387 in 2018, and his OPS fell below the .700 mark in the pitcher friendly confines of the FSL. He started the year off quite well, hitting .305/.347/.537 in April, but from there he only hit over .250 in one other month and his highest monthly OPS was just .645. Surprisingly, Blankenhorn did still lead the Miracle in doubles, triples, home runs, and RBI. The 2019 season will be Blankenhorn’s fifth in the organization and his time in the AFL could have a bearing on if he moves up to AA to start the year or finds himself back in Fort Myers looking to improve upon his prior year in the opening months. During his time in the AFL it will be interesting to see if he sticks at just one position or continues to be moved around. I’ll also be paying attention to his extra-base hit totals for an indication that his slugging numbers will rebound whenever he is promoted out of the FSL. Like Blankenhorn, Lujan came to the Twins organization courtesy of the 2015 draft when he was selected in the 35th round. He was drafted out of Westmont College, where he was teammates with Andrew Vasquez who pitched in the AFL last year before making his major league debut with the Twins in 2018. Lujan will hope to follow that same path during the 2019 campaign. Lujan spent the 2017 season entirely with the Cedar Rapids Kernels and was a standout in their bullpen. In 54 innings he amassed 17 saves while posting a 1.33 ERA and 0.91 WHIP. He struck out a hitter per inning and was stingy with walks as he allowed just eight on the year. Moving on to Fort Myers for the 2018 campaign, Lujan was used more as a multi-inning weapon, as he appeared in four fewer games but pitched 17 2/3 more innings. He saved four games along with striking out 68 in 71 2/3 total innings pitched. He walked more hitters and raised his WHIP to 1.26 in the FSL, but still posted a solid 2.64 ERA with the Miracle. The competition inthe AFL will be a solid test for Lujan, but no matter how he fares he should find himself ticketed for AA to start in 2019. I’ll be watching to see if his career neutral splits against lefties (.625 OPS against in 2018) and righties (.641 OPS against) hold true in the AFL and if he’s used for multiple innings to try to maximize that trait. Lujan is also eligible for the Rule 5 draft this offseason, so could be making his case to be protected on the 40-man roster. Smeltzer was one of the pieces that came to the Twins organization in the Brian Dozier swap with the Dodgers at the deadline. He was drafted by the Dodgers in the fifth round of the 2015 draft and while he’s struck out over a hitter per inning in his career, he’s also given up a bunch of hits to limit his upside. Midway through the 2018 season L.A. transitioned him to the bullpen in AA, and that is where he remained after coming over to Minnesota. With Chattanooga he made 10 appearances totaling 12 innings pitched, logging a 3.00 ERA and 1.33 WHIP while striking out sixteen and walking just two. Since he is so new to the relief pitching routine, the AFL will be a fantastic environment for him to learn any tricks of the trade from a bevy of new coaches and teammates. As a former starter he had also been using a full pitching repertoire, so I’ll be curious to see if I can pick out whether he has dumped any pitches to focus on his best ones, which includes a plus changeup. Also coming over from the Dodgers in that same trade, was outfielder Luke Raley who had an excellent season at the AA level in 2018. His .822 OPS ranked seventh in the Texas League and he started at DH in their All-Star Game, where he was 2-for-4 with a double and an RBI. He didn’t come over to the Twins early enough to be considered for our midseason prospect list, but MLB.com has slotted him at number 19 in their updated top 30. In 27 games after being placed on the Lookouts roster, Raley slashed .276/.371/.449 with three homers and 16 RBI. Before that he hit 17 home runs with the Tulsa Drillers, but he’s not all just home run power either. His 47 extra-base hits on the year included 19 doubles and 8 triples, helping him rack up 80 runs scored on the season after totaling 102 in the California League the year prior (ranked second). He’s also a solid outfielder with a strong arm who with can handle center field if needed and has also played first base. He strikes me as having the makeup and profile that could turn into leadoff hitter with some power in the future which sounds a lot like the guy the Twins traded away to get him, but to reach that type of ceiling Raley is going to have to cut down some on the strikeouts while also drawing a few more walks. I’ll be very interested to see how Raley follows up his excellent 2018 season in Arizona as he readies himself for triple-A next season and establishes himself in the organizational depth chart. Davis was selected in the 24th round of the 2015 draft but didn’t make his debut until the following season as he recovered from a torn labrum he suffered during the college season with Appalachian State. He started his professional career with an astounding seven home runs in just twelve games with Elizabethton before they bumped him up to Cedar Rapids. He finished the year with an .808 OPS with the Kernels and continued that success the next year, earning his way to Fort Myers where he finally had some struggles. He started the 2018 season back with the Miracle but again earned himself a midseason promotion as he upped his OPS significantly by both drawing more walks and clubbing more extra-base hits. With the Chattanooga Lookouts he kept that same theme going, finishing with a better OPS than he had in Fort Myers. I’d venture Davis will start next year back in AA, but a strong showing in the AFL could accelerate his timeline to AAA. As a corner outfielder who has played almost exclusively right field the past two seasons, the pop he’s shown thus far is going to have to continue trending upward to crack a crowded Twins outfield situation and that is what I’ll be looking for from Davis in the AFL. Another one of the several 2015 draftees who will be eligible in the Rule 5 draft this winter, Bray does hold a distinction that none of the others do: He is #OneOfUs. He went to high school in Eden Prairie and was part of their 2011 team that won the American Legion National Championship. He also was the winning pitcher on the team that won the 2010 State Championship at Target Field. He went to college at South Dakota State University and is now the record holder in several categories there as a pitcher. Seth Stohs also caught up with him earlier this year to talk about those things and the rest of his career to that point, so be sure to check that out. Bray finally got on the mound in late June with the Fort Myers Miracle and was fantastic through the end of the season. He made 19 appearances totaling 38 1/3 innings out of the bullpen, posting a 1.88 ERA and 1.10 WHIP while striking out 9.4 per nine innings pitched. He also surrendered just seven walks as he maintained the upper echelon control and command he’s been known for (1.5BB/9IP for his career). Since he was on the disabled list for the first three months of the season Bray will be looking to make up some development time in the AFL and could also be a good gauge to determine his readiness for AA. I’ll want to see him maintain that low walk-rate along with striking out at least a hitter an inning. That’s a good formula for anybody, but it’s one Bray will need to keep up with due to his command and control profile as he continues his climb up the minor league ladder. Good luck to all the Twins players in the AFL this season, and I’m looking forward to following along with everyone at Twins Daily! Also, if there is anything specific you would like to see included in these recaps, let me know and I’ll see if I can work any such ideas into these recaps. Here is a link to last year’s final one to get an idea of what to expect! -If you haven't already checked it out, Seth's conversations with all these guys playing in the AFL is must read material. -The Minnesota Twins announced their 2018 Minor League players of the year, with Alex Kirilloff taking home the player award, and Lewis Thorpe the pitcher. Congratulations to both! -MLB.com went through the biggest movers in their end of year prospect rankings, and Kirilloff tops the list as he moved from number 30 all the way to the top 10. -With the AFL season kicking off, MLB.com also picked out the top prospect from each team going, with Brent Rooker checking that box for the Twins. They did the same for sleeper prospects, with Griffin Jax the Twins selection. -After partnering with the Chattanooga Lookouts for the past four seasons, the Twins will be moving their double-A affiliation for the 2019 season to the Pensacola Blue Wahoos, also of the Southern League. It sounds like a good step up in facilities for the organization, as the stadium was built in 2012 and is located on the harbor of the Gulf of Mexico. Please feel free to ask any questions about the AFL or the players who are there! Thanks Steve. I look forward to the AFL season reports. Thanks, Steve.And I am looking forward to the AFL season as much as you. The player I want to follow every time out is Jax.I have a feeling that this kid can become something special.Probably not an ACE, but a legitimate middle of the rotation starter on a very good team.Will be great seeing how he does pitching to some of the best prospects in the game.Also good that everyone remember that with all the pitchers on these teams, they will rarely pitch more than 3 innings in a game. Also fun watching those two guys who came over from the Dodgers.If one of these guys can develop into a solid big leaguer, will be another good move by the FO. Very interested to see how Jax holds up against some stiffer competition. This will be a good test for him. "Many of the top prospects in baseball are sent here to make a final impression for a call-up next year, but there are also many experienced minor leaguers on the doorstep who are evaluated for protection on the 40-man roster, or those trying to make up some development time after an injury"
was the first response I've received. So, again, thank you. Raley was the only Twins player seeing action on opening day.Was 2-4 with 3 rbi as Salt River was 10-8 winners. Davis, like Raley on Tuesday, had a couple hits and 3 rbi in yesterday's game.Blankenhorn led off and went hitless, but did work a walk.The first Twins pitcher seeing action was someone I am gonna have to get to know, Smeltzer.In a game that Salt River lost big, 11-9, Smeltzer was one of two pitchers not giving up any runs.He had 2.0 shutout innings with 3 hits, 2 strikeouts and nooooo walks. I saw your other comment and was going to respond with that exact sentence, but figured I'd let it roll. So, I'm glad you found it here! So we'll unfortunately have to wait a little while for Rooker to appear. Salt River was a walk-off winner, 7-6, in 11 innings on Thursday.And yes, the winning run was the player who began the bottom of the 11th on second base...hate that rule. Luke Raley was 0-4, however, did walk twice including once in the 11th.Jaylin Davis had another 2 hit game (2-5).Hector Lujan had a blown save, giving up 3 runs (2 ER) in 0.2 innings.Adam Bray got the win, pitching the last 2.0 shutout innings with 2 K's and 2 BB's. Interesting, I wonder if we will see Raley with the Twins next year. We already have some other young OFs like Cave and Wade, but maybe Raley could crack the 2019 roster at some point.